I did not have festive jewelry to wear to a Holiday Party this past Saturday, so I decided to whip up a Christmas Tree pendant using Makin's Clay®. Late Friday evening I remember about the party, then got busy making it. I got compliments from several people. One lady asked me to take it off so she can see how it's made. I was happy to oblige. I started out by extruding the clay from the Makin's Clay®, Professional Ultimate Clay Extruder® - Disc #8; see my tutorial on how to use the extruder. To make the tree; start with the base, by laying down a strip, determine width, then bend on one end. Then bring the strip across the top, while partially overlapping it over the strip that is already laying down. Repeat the process. As you move up the tree, narrow the shape. Add a long strip on the back center in order to hold down the strips. Using the Makin's Clay® Mini Geo Cutter Set, cut out a star and glue to the treetop. To color it, I used Silver Gilder's paste, then sealed it with Sculpey Clay Sealer. It important to seal it, or the paste will rub off. I wire wrapped the beads around the tree, using 22 gauge silver plated wire. In between each bead I added a loop, which has been twisted two times; to keep from coming apart. The loops keep the beads from rolling around. I secured the wire in the back of the tree by twisting it several times. I glued a flat back bail and added a leather cord. Well, I hope you like my pendant and there's still time to make this stylish tree to wear to your holiday gatherings. Christmas is around the corner. Everywhere we go, we see stores, streets and homes festively decorated. 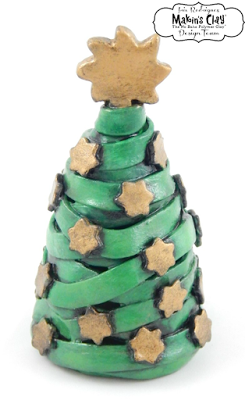 Well, I wanted to add to the festivities with my Makin's Clay® Christmas tree. This tree is 4 x 2 inches. It makes for a great home decor, gift, or to have in your desk/cube at work, where it won't take up much room. 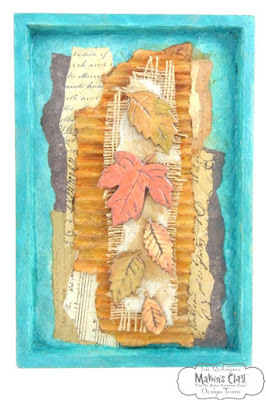 To find out how to make this project and get other clay project ideas visit the Makin's Clay Blog. It's time to share my make (lol, get the little pun there)...my Steampunk Winged Clock, made using a Tim Holtz Clock, chipboard, polymer clay, gears and my fav metallic wax. Don't know why but I just love clocks. I don't even have a real clock in my house, or like wearing watches. I like them for their aesthetics, their meaning, their beauty and for making art with, of course. These are the ways I use clocks in my art. In Art Journaling; like to stamp and stencil clocks. I like to use them in polymer clay work, using molds, like in my pencil holder. 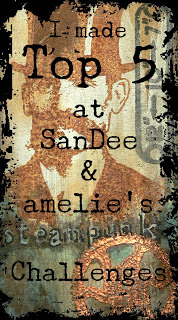 Like them in steampunk jewelry, assemblages; mainly using the parts of a clock or watch. You can see this this example in my Time Destruction piece. I like using them as a substrate for 3D work like this clock; or my other clock pieces: Time Watchers, Father Time, Fairy in a Clock, and Fly. Currenly, working on another clock project, will share later. For now, hope you like my Steampunk Clock. I recently went to a gallery to look at an all clay exhibit. There were ceramic bowls, sculptures and even painting using a bas relief technique. There was one artist that made huge somewhat abstract mechanical, industrial shapes; gears, tracks from a tank. All of the pieces were made out of various types of earthenware clay. The pieces all looked like genuine worn out metal...pretty cool, I thought. 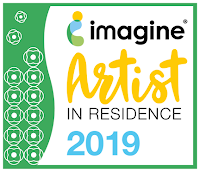 Seeing this exhibit, got me thinking about how how polymer clay is so diverse; you can make just about anything look faux with this great medium. So I decided to make my own faux ceramic bowl. 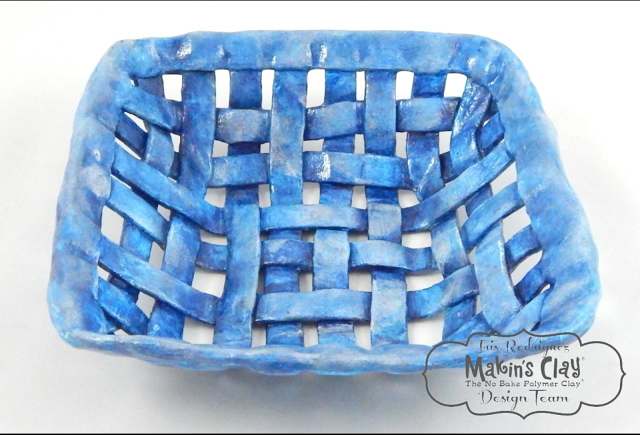 I made this blue weave bowl using Makin's Clay®; an air dry, no bake clay. I used clay, acrylic paint Makin's Professional® Ultimate Clay Extruder® for the strips, boy was it ever so nice to use for this project; no need to manually cut the strips. 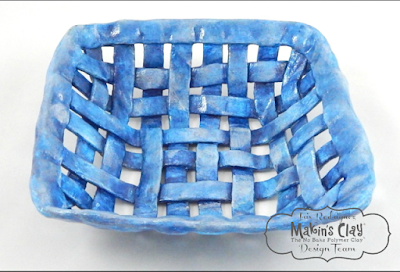 To learn more about how to make this piece, check out the Makin's Clay® Blog. I have great and exciting news. 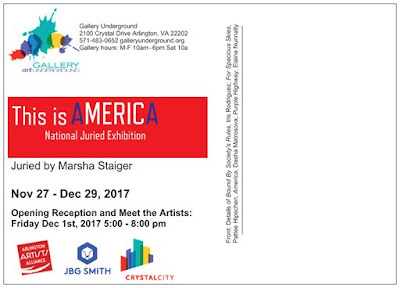 I will be in my first Art Gallery Exhibit. 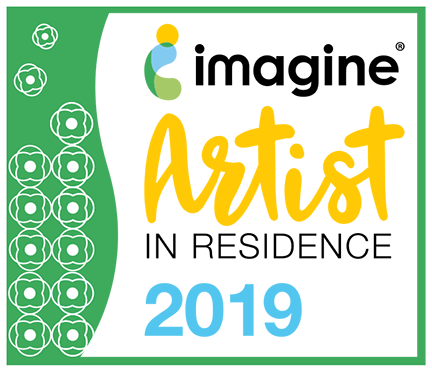 I will be part of biennial Artspace Gallery, Richmond, VA ThinkSmall 9! Exhibit Oct 27th through Dec 17th. In this exhibit, the art is 3 inches or less. 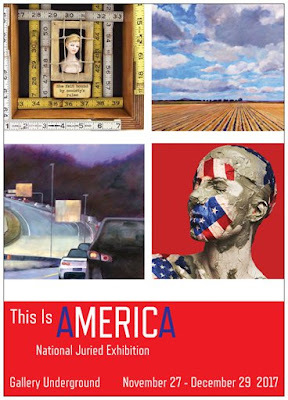 All art will be on sale and it's to raise money for the gallery. Always like to support the arts. I made a dress sculpture made out of Polymer Clay, using FIMO Professional Clay. I call this piece House Dress. Lately I have been obsessed with Dress/Figurative sculptures with architecture aesthetics, but with with a niche or opening. I like the idea of looking at an opening in art; it's as if there is something secret going on inside. I have made a couple of other dress sculptures using different materials; polymer and paper clay, paper mache, wire, plaster; like experimenting with different materials. I have a quick share today. I am showing you what's in my Art Journal. 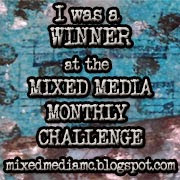 Finally decided to blog about it. I maintain two different size journals; a 9 in. x 12 in. and a 6 in. x 6 in. I like creating in both sizes, depends on the inspiration. Most of my watercolor I tend to in the smaller size. In these pages I have created imaginary neighborhoods, where the homes are surrounded by giant flowers, that serve as trees.